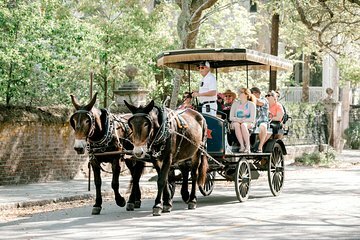 This tour begins at the Big Red Barn in downtown Charleston, where you'll meet a knowledgeable driver-guide and settle into a carriage drawn by a pair of horses. Follow a route that takes in some of the historic downtown district’s most elegant mansions and gardens, learning about the architecture of each place as you drive along. Catch the scent of jasmine flowers from deep, shady porches, and pass by rows of bristling palmetto trees. Get an overview of Charleston’s dramatic history, from long-ago pirate raids to plantations, Revolutionary battles, the Civil War, and Reconstruction. The city was founded in 1670, and Charleston's historic buildings have been meticulously preserved and restored. Guides combine humor with history for a lighthearted experience of Charleston’s atmospheric center, and you'll cover between 25 and 30 blocks of the downtown district. This tour concludes with drop-off at the Big Red Barn. Not only did our carriage ride begin on time, we also drew the best carriage route and were able to see Rainbow Row. I was unaware of how the city of Charleston requires a drawing system so that all of the carriages would not be on the same route holding up traffic in the city. Our tour guide was very knowledgeable and we really enjoyed ourselves. got there a few minutes early and met an older gengleman who gave us the lowdown on all the things and people that made the tour what it was. quite an educated man and very intelligent ans very well mannered. hopped up in the carrigae and away we went. it is amazing how much history has transpired since the days of the pirates and before slavery, during slavery and up through martin luther king to today. beautiful town, amazing gardens and all the history you might ever want to know about this beautiful town. can't say enough. well done!!! A great way to see this beautiful city! great tour. friendly and informative. wish it was longer because it was so enjoyable. I liked this tour - but there were lots of competing carriages and other tours about town ... which kept it interesting. I loved the horses and the information we got along the way, so I'm going to recommend it! This was great and the animals well treated (they had their own personalities). The guide was great and talked the whole time about the history and buildings. Charleston is beautiful. Shawn was our driver yesterday and he was outstanding. The information he provided was both interesting and funny. He had a great attitude and his love for Charleston was very evident. Excellent tour - a must go! Wonderful carriage tour with Palmetto Carriage Works. Comfortable and informative one hour ride. Saw beautiful architecture, both churches and houses. Our guide was very informative regarding Charleston history. Fun for both younger and older! Quite an entertaining and educational comprehensive experience. Loved this tour! It was wonderful hearing and seeing old Charleston and the beautiful homes!